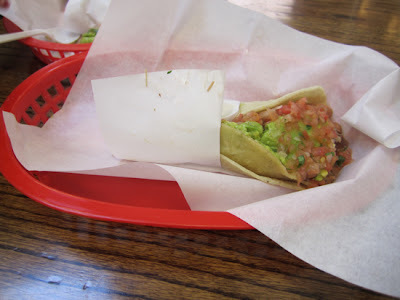 Just writing the the title of this post, reminds me that I need to write a bigger post that lists all of my favorite places to eat in SF. 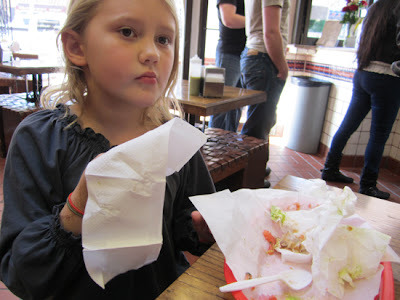 But since La Taqueria is possibly one of my most memorable taste moments ever, and I recently got to share it with Clara, I thought I would mention it here. 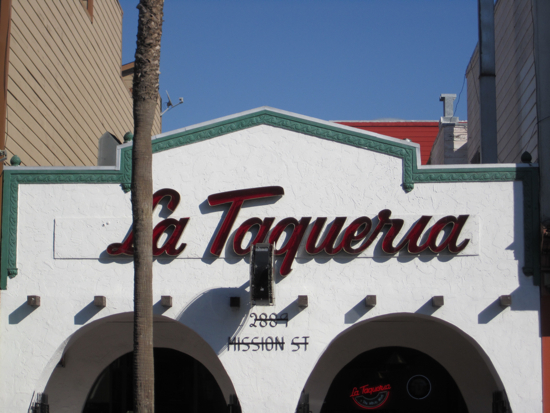 La Taqueria is in the Mission, and it is on Mission Street, between 24th and 25th Streets. 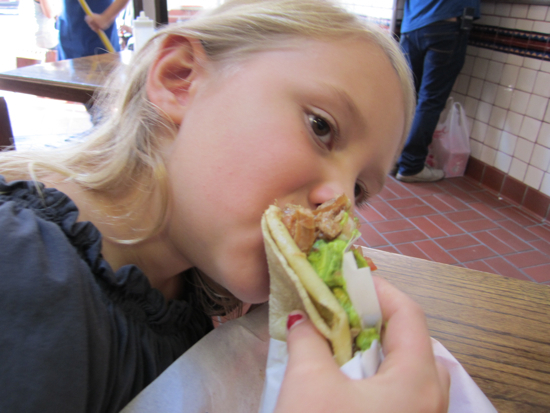 The best thing to get there, in my opinion, is the taco carnitas, with avocado and cheese. I know, to a purist, that's revolting, but it is so good, and it's the way I first got introduced to it. I was 15 when I was brought to La Taqueria for the first time. I was with my best friend Stephanie, and her parents, Cinda and Steve brought us there. They were the family that really introduced me to food. Every time I ate at their house, we had food that was cooked from beloved cookbooks and recipe cards, and food was talked about as it was being prepared. 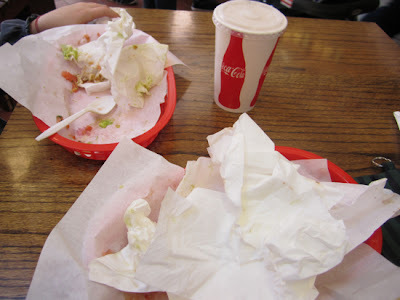 I had never been around people who loved food so much. It was a whole new world for me. So on that day we went to have tacos, her parents ordered for us--Cinda was the kind of person who not only had lists of where to eat in what town, but exactly what to eat there--and that's how I found myself eating this most perfect taco. Afterwards, we walked out onto the street, where there was some kind of protest happening, which we weren't there for, but got kind of swept up into it. Jesse Jackson was speaking, and all I can remember was him leading a chant "Si, se puede." It was such a powerful experience and one that I go back to as a pivotal moment in my life. Fast forward to now, almost 30 years later, and it's still there, exactly the same. Even the guy making the tacos is the same. I introduced Clara to him, ordered the tacos and a horchata, and told her the story. Sometimes, there are food or places that can change your life. A great experience to share with your kids and friends. love it! very interesting topics, I hope the incoming comments and suggestion are equally positive.